MonsterGrip Ice Cleats by Dry Guy/MaxxDry are ideal for all outdoor activities. 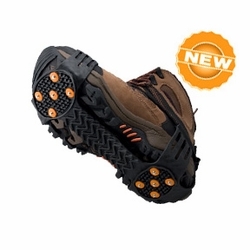 They are designed as lightweight pull-on "Snow tires" for all footwear. Perfect for Dress, Casual, Work, and Sport shoes or boots. Intended for pedestrians, the elderly, or office workers walking to and from parked cars, joggers, postal workers, Ice fishermen, firemen and all professionals; anyone demanding greater stability, self-control, and steadfast traction on Ice and Snow. BOOTS NOT INCLUDED. NOT FOR TECHNICAL CLIMBING. NOTE: Also sold as MAXX GRIP IS Ice Studs. *Note: If you are in between sizes, or if you are using Monster Grips on oversized winter footwear or boots, we recommend that you go up one size.